The beginning grade school years provide children with a mathematics foundation they will build upon throughout their academic years. Until students learn basic math concepts, such as number operations, geometry, measurements and probability, they won’t be able to solve the complex problems found in algebra, calculus and statistics. By age 7, many children can compute number operations that result in answers into the teens, according to the PBS Parents website. Not only can first graders add and subtract, they can also use these operations to do simple math problems. While solving straightforward problems, such as 5 + 10 = 15 is part of the first-grade year, adding an imaginative story activity to teach math to your 7-year-old student will enrich his experience. Use props or visuals to engage him in the lesson. For example, tell the story of "The Three Little Pigs." Have the pupil build the brick house using blocks. While he is building, ask him to solve simple math problems about the bricks. For example, you can say to him: "Start with eight blocks. Now add six. How many bricks are in the pig's house now?" You can also modify this problem to ask the student to subtract the added blocks from the total number of blocks. Even though 7-year-olds aren't developmentally ready to calculate obtuse angles or solve complex radius problems, they are building their framework for geometry. First and second grade students can identify, create and combine 2-D shapes. They can also recognize and build simple 3-D objects such as cubes. 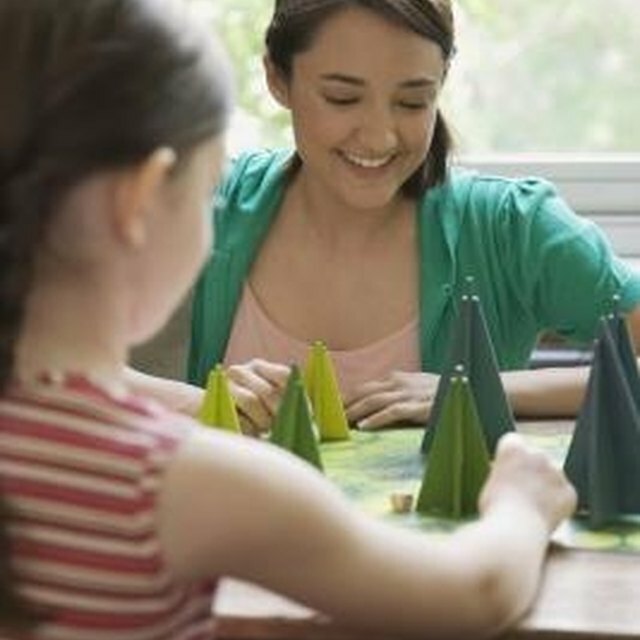 Try two different, but connected, activities that combine math and art into a creative composite craft with 2-D and 3-D shapes. Have the 7-year-old draw and cut out basic shapes such as rectangles, squares, circles and triangles. Ask her to form the shapes into a collage to make a picture. For example, a circle with two triangles on top represents a cat's head; a square with a triangle on top represents a house. Repeat the activity with 3-D objects, making a sculpture. Use foam blocks, spheres and cubes and school glue to create 3-D houses, animals or people. Seven year olds learn how to take measurements for length and time, and they also learn how to represent and interpret the data. Help your young pupil make and understand measurements, by giving him an ordering activity. Gather at least three sticks of different sizes. Have the child place the sticks in order from the shortest stick to the longest stick. Next, have the child place several shorter sticks end to end so that they are equal in length to the length of the longest stick. For example, three short sticks placed end to end might equal the length of one long stick. Connect this to number operations. Have the child use a ruler to measure the three shorter sticks. Add the lengths to find the size of the long stick. Seven year olds can also collect mathematical data and display it on a simple graph. Have your student take a poll of her classmates or family members to illustrate how to collect and represent data. For example, she can pick 10 friends and can ask each friend to reveal her favorite color. As she interviews her friends, write the data on a sheet of paper. For example, write: "Two friends like green. Three friends like blue. Four friends like pink. One friend likes yellow." When she has finished collecting the data, help her make a bar graph on a poster board. Mark the poster board into four vertical sections to represent the four colors. Across the top of the board, list the four colors. Along the left side of the poster board, list numbers one through 10. Have her draw a colored bar for each color. Help her draw the bar up to the number of students who reported liking that color. For example, four friends said pink was their favorite color, so she would draw the pink bar up to the line that represents four. Loop, Erica. "How to Teach Basic Math to a 7-Year-Old." Sciencing, https://sciencing.com/how-to-teach-basic-math-to-a-7-year-old-12747462.html. Accessed 20 April 2019.